I recently asked my Facebook friends who their favorite makeup/beauty YouTubers are, which opened up a whole new world to me! I'm kinda late to the party, but better late than never, right? I've quickly become totally obsessed and completely mesmerized with these tutorials...anyone else?! My favorite so far is Kathleen Lights. Leave me a comment with your go-to YouTube gals so I can check them out! Ok that had nothing to do with this outfit, but I literally have a makeup tutorial playing in another tab (too many tabs open) and it's been my life lately, so anyway... This burnt orange velvet skirt is on sale for $21.97!!! Nordstrom Rack for the win! I love the style contrast of the dressy skirt with the casual sneakers and the texture contrast of the skirt with the leopard jacket. This has got to be the softest outfit I've shared to date! 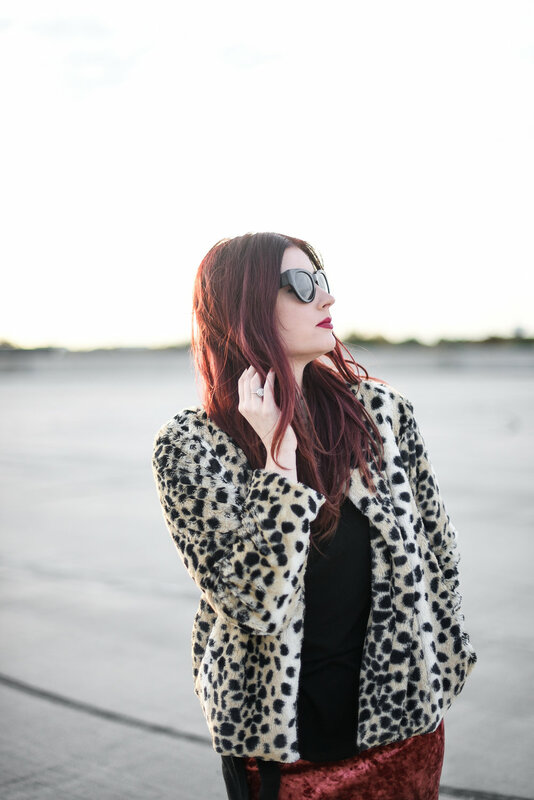 Here are a few more leopard and velvet finds all under $50!